Uttar Pradesh State Entrance Exam commonly known as UPSEE 2016 is conducted every year by UPTU, Lucknow. UPSEE 2016 is state level exam for various UG and PG courses such as B.Tech, B.Arch, B.Pharma, management and other courses. This information is based on the previous year notification and the latest notification will be updated as per the scheduled date. Candidate those who are interested to apply to appear in UPSEE 2016 will have to wait. Candidates can check all details of UPSEE 2016 from the same page such as application form, admit card, exam date, results etc. DIRECT ADMISSION (LATERAL ENTRY) TO SECOND YEAR OF B.TECH./ B.PHARM./MCA :The eligible candidates seeking direct admission to second year of B.Tech or B.Pharm. (only for pharmacy diploma holders) or MCA (for BCA, B.Sc (IT/ Computer Science) degree holders) in institutions affiliated to UPTU, Lucknow are required to submit the application forms by the last date. Such seats are limited to a maximum of 20% in addition to the sanctioned intake in institutions/ colleges for different courses at first year level. However for B.Tech./B.Pharm., students belonging to B.Sc. stream shall be considered only after filling the seats in this category with students of Diploma stream. Direct admission to second year shall not be made in B.Arch./BHMCT/BFAD/BFA Courses. Number of admissions in all courses offered at Institutions affiliated to UPTU, Lucknow, will be only through UPSEE-2016, after deducting the seats. 15% of total sanctioned seats available in Private Institutions to be filled by the NRI candidates under Managemenet quota. ADMISSION TO NON-RESIDENT INDIAN (NRI) CANDIDATES IN FIRST YEAR: NRI candidates, who possess prescribed qualifications, may get direct admission on 5% seats of total intake in Govt. aided and Private Institutions having approval from AICTE for NRI seats on merit, subject to the latest instructions of Govt. of U.P. ADMISSION TO (FN) /(PIO)/(CIWGC): These supernumerary seats shall be exclusively meant for the FN/PIO/CIWGC students in undergraduate courses with the condition that under no circumstances a seat remained unfilled shall be allocated to candidates other than a FN/PIO/CIWGC. The candidates should be the resident of Uttar Pradesh. The candidate must be passed class 12th from a government recognized board for All UG courses. For all PG courses the candidates should be passed the graduation with 50% (45% for reserved). For lateral entry in B.Tech or B.Pharma the candidates must have three year diploma in relative field with 45% (40% in case of reserved candidates). There is no age limit for UPSEE 2016. UPSEE 2016 Application Form will be released as per the scheduled date mentioned in the table below. Their are two modes through which UPSEE 2016 application form can be filled, Online and Offline. Candidate can either apply Online application form or get it from the help desk centre of UPTU. UPSEE Admit card will be available online to every candidate. Downloaded admit card shall be treated as valid admit card. The admit card contains all the details about the examination. The date for downloading UPSEE Admit Card is given in the table. 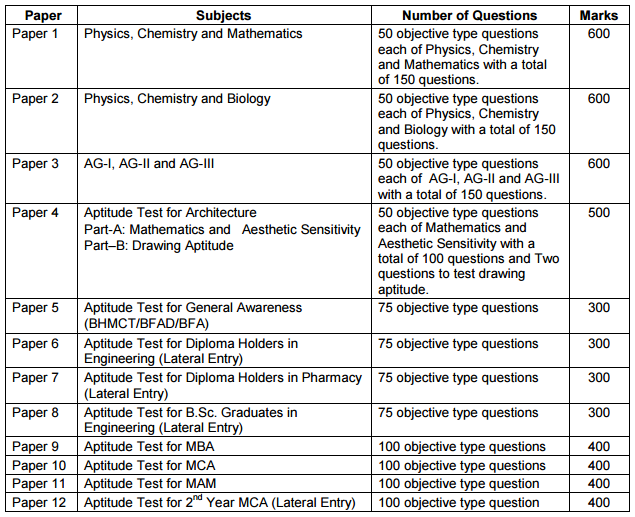 UPSEE-2016 (OMR mode) will be conducted for Twelve papers with objective multiple type questions except Drawing Aptitude test (Part B of paper 4). The candidates are required to opt papers and subjects for appearing in the entrance examination as mentioned. Every objective multiple type question would carry four marks for each correct answer. More than one answers indicated against the question will be deemed as incorrect answer and no marks is awarded for the incorrect answer. There will be no negative marking. However, a record of incorrect answers given by a candidate will be kept separately by UPTU.